The process below outlines the potential for school implementation. This exciting process is also used for community development and economic empowerment. Churches, community centers, etc., are equipped with the training and tools necessary to create their own supplies and economic opportunity becomes a reality. 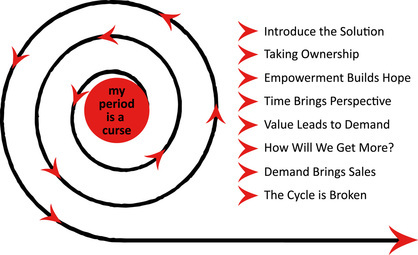 The first step to this process is to introduce the solution of the washable, re-usable menstrual cloths. This is a new concept within their culture and will take compassion, trust and time. We introduce the concept with the cooperation of the school and its staff. We provide the cloths, train the staff and the girls in proper use and care. We then let the product/solution speak for itself. Once the girls experience the product and the change it brings to their lives, they take 'ownership' of the issue and it becomes something they can manage - not something they need to endure. The girls are seeing the change in their lives and the potential of a normal life that's not controlled by certain days of the month. They step into confidence that life has HOPE. Several months after introducing the cloth menstrual pads, the girls can't imagine life without them. Others in their communities are hearing of this product and the product increases in esteem and value. By now, their daily living patterns have fully embraced the cloths as a normal course of life. The thought of not having these cloths is not acceptable and the question is now being raised. How Will We Get More? The process is now ripe for incentive. It is now that the concept of making their own pads is introduced. The curriculum we've created is introduced through the local school district. Each school will then oversee the program as part of its curriculum. The girls continue to learn the skills and develop their ability to make the cloths. The cloths produced at the school are used by incoming students. In time, there will be a market demand due to the students' use of the cloths and word of mouth in the community. As the girls increase in their ability to produce cloths, the workmanship is now acceptable to sell the cloths. Sales from the cloths will provide funds to purchase more fabric -- to produce more cloths -- to purchase more fabric. This cycle now offers vocational training, building economic incentive, empowerment and opportunity to the girls. Girls once marked by shame and destined to despair are now change agents for their generation - bringing hope and promise to their communities.